This chapter consists of four sections. 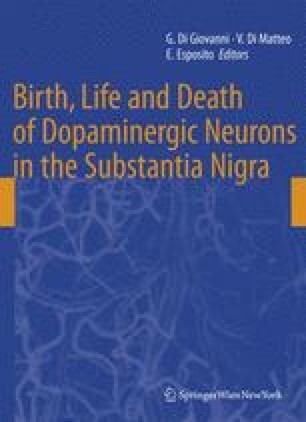 The first section provides a general description of the electrophysiological characteristics of dopamine (DA) neurons in both the substantia nigra and ventral tegmental area. Emphasis is placed on the differences between DA and neighboring non-DA neurons. The second section discusses the ionic mechanisms underlying the generation of action potential in DA cells. Evidence is provided to suggest that these mechanisms differ not only between DA and non-DA neurons but also between DA cells located in different areas, with different projection sites and at different developmental stages. Some of the differences may play a critical role in the vulnerability of a DA neuron to cell death. The third section describes the firing patterns of DA cells. Data are presented to show that the current “80/160 ms” criteria for burst identification need to be revised and that the burst firing, originally described by Bunney et al., can be described as slow oscillations in firing rate. In the ventral tegmental area, the slow oscillations are, at least partially, derived from the prefrontal cortex and part of prefrontal information is transferred to DA cells indirectly through inhibitory neurons. The final section focuses on the feedback regulation of DA cells. New evidence suggests that DA autoreceptors are coupled to multiple effectors, and both D1 and D2-like receptors are involved in long-loop feedback control of DA neurons. Because of the presence of multiple feedback and nonfeedback pathways, the effect of a drug on a DA neuron can be far more complex than an inhibition or excitation. A better understanding of the intrinsic properties of DA neurons and their regulation by afferent input will, in time, help to point to the way to more effective and safer treatments for disorders including schizophrenia, drug addiction, and Parkinson’s disease. This work was supported, in part, by a NARSAD Independent Investigator Award and NIDA DA12944.